The Frankfurt School refers to a school of neo-Marxist interdisciplinary social theory particular established at the Institute for Social Research at the University of Frankfurt, Germany in 1923. Tarr's investigation focuses on three key issues. The first is the Frankfurt School's original program of providing a general theory of modern capitalist society. The second is the claim to represent a continuation of the original Marxian theory through the school's Critical Theory. The third is the scientific validity of Critical Theory in light of the generally accepted canons of the natural and social sciences. Tarr proposes that in the last analysis, Critical Theory is simply another existentialist philosophy. As such, it is a specific expression of certain socio-historical conditions and of the situation of a particular social group, the marginal Jewish bourgeois intelligentsia of Central Europe. This European-Jewish contribution became apparent after the great metaphysical impulse of the pre-Socratic and Platonic-Aristotelian philosophies had run their respective courses. Both philosophies represented philosophical schools of ethics, and both wanted to help man take up a defense against the storms of passions and fate. It was from these ancient sources that the Frankfurt School emerged. 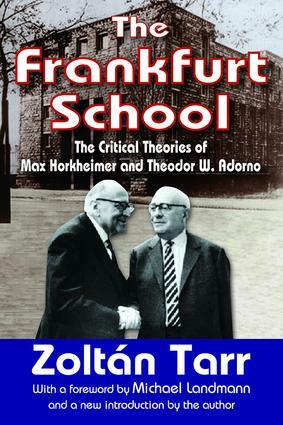 The Frankfurt School derived its impetus in the twentieth century, in which Tarr claims a shift occurred from the ontological to the subjective realm. This in turn led to deep changes in philosophical theory and practice which led to a more psychologically oriented mode of social thought. This in-depth study covers the entire career of the Frankfurt School's Critical Theory from 1923 to 1974. It does so by applying the same standards of criticism to its primary doctrines as it turned on other theories, but with a keen sense of balance and fairness.